On May 20, half the people of Venezuela went to vote. They delivered a mandate to Nicolás Maduro, the 55-year-old successor to Hugo Chávez and the leader of the Chavista movement. Maduro won 68 percent of the vote. His closest challenger, Henri Falcón, who had been a Chavista until 2010, took 21 percent of the vote. It was clear for months that Maduro would win the election. This had nothing to do with “irregularities” in the voting process, as the European Union put it. 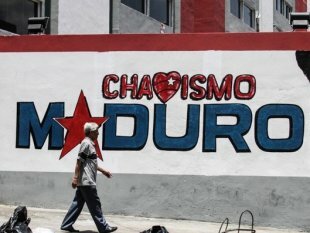 The residue of loyalty to the Chavista movement is clear. It is also clear that the opposition to Maduro and to the Chavista movement represents the oligarchy. These are not the sentinels of democracy. They are merely using the word “democracy” to return to the old ways. This is clear among Venezuela’s poor, who stick with the Chávez movement despite the privations of the current period. Why did half of Venezuela’s population not vote? In the last presidential election—which elected Maduro—80 percent of the population voted. What is the reason for the decline? It has everything to do with a clever strategy worked out by the opposition to the Bolivarian Revolution, the revolutionary process opened up in 1998 when Hugo Chávez won the first of many elections. The opposition—and its foreign allies (particularly the government of the United States)—knows that they cannot win at the ballot box. What they have done is to encourage the United States and their fellow oligarchs in Latin America to put the Venezuelan economy under siege. The pain from this “economic war” has certainly disoriented and demoralized the Venezuelan people. At which point, still unsure about their ability to win an election, they have sought to reduce the legitimacy of the Chavista government. Hence, the opposition—backed by the oligarchs and the United States—boycotted the election. This is why only half the population voted. The “irregularities” in this presidential election came—essentially—from outside interference in Venezuela’s political process. Many are up in arms in the United States about allegations of Russian interference in the U.S. presidential election. But they are totally sanguine about the open intervention of the United States in the Venezuelan election. There has been no public criticism of the statements made by the White House—notably Vice President Mike Pence—who called the election a “fraud and a sham” weeks before the Venezuelans went to the polls. Strikingly, the European Union—which has been so sharp in its criticism of the election—and the United Nations were both invited to send election observers, but both declined. Those international observers who did come—including former Spanish Prime Minister José Luis Rodríguez Zapatero—have said that they did not see anything outrageously untoward in the election process. Certainly, there will be problems. No election is conducted without some measure of fraud. According to the Electoral Integrity Project—based at Harvard University and Sydney University—the United States displays the worst election performance among all Western democracies. To point to this or that example alone is hardly a good measure of a failed election. That the opposition won the 2015 parliamentary elections in Venezuela suggests that the government—even then led by Nicolás Maduro—did not fix the elections to their benefit. Why the opposition decided to boycott this election has—it seems to me—little to do with the possibility of a fair election in Venezuela and much more to do with the attempt to isolate the Venezuelan government and to set the stage for its collapse. In January, Maduro announced that Venezuela would hold a presidential election in the coming months. Within no time at all, the United States and the European Union said that they would not recognize the election’s legitimacy. The U.S. and the EU found quick allies in the Lima Group, an intergovernmental organization of 17 states of the Americas. These 17 states—from Canada to Chile—have taken an openly hostile position not only against the government of Maduro, but against the Bolivarian process inside Venezuela and in the Bolivarian process across Latin America. Close coordination between the United States, the European Union, and the Lima Group is suggested by the similarity of the language used by their representatives. It is important to know a little about the Lima Group, which has functioned as the Latin American mouthpiece for its domestic oligarchs and for the United States and Canada. It was set up in Lima (Peru) in August 2017. The purpose of the Lima Group was to overthrow the government of Venezuela. It was a formation that had been created to put pressure on the Organization of American States (OAS), set up in 1948, to take a firm position against Venezuela. For some time now, the United States and Canada have not been able to get their way in the OAS. The emergence of the Bolivarian Alliance for the Peoples of Our Americas (ALBA) in 2004 was a direct challenge to the OAS. Led by Chávez and Fidel Castro, ALBA pushed aside the OAS and produced new formations—without U.S. control—in its place. Chávez called the OAS “a corpse that must be buried” and suggested—in 2010—that it was the “sign of a dying empire.” ALBA would soon have 11 members. It promised a new view of Latin American sovereignty and economic cooperation. With the coup against Honduras in 2009, the United States announced a more aggressive posture against the ALBA dynamic. Honduras, an ALBA member, now left the group. It was the clearest sign of what was to come. Since 2010, the United States and its allies have worked hard to roll back the “pink tide” in Latin America. Pressure was put on Venezuela, the heartbeat of the ALBA process. When the Lima Group was set up in 2017, Peru’s Foreign Minister Ricardo Luna said, “What we have in Venezuela is a dictatorship.” There was no need for evidence. The term “dictatorship” would now be used by these governments to define the politics of Venezuela. Brazil, another member of the Lima Group, had recently conducted a “soft coup” against the government of President Dilma Rousseff. That did not disqualify them from being a sanctimonious part of this alliance. Nor was there any uneasiness about the Peruvian government of President Pedro Pablo Kuczynski—whom Maduro routinely called a lackey of Wall Street; Kuczynski would later resign under charges of corruption, but not after he offered a pardon for Peru’s dictator Alberto Fujimori. None of these men looked in the mirror. 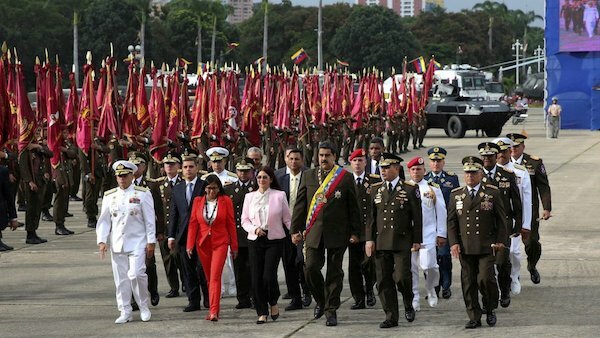 They had their fingers firmly pointed toward Venezuela. One of the leaders of the Lima Group is Canada, whose Foreign Minister Chrystia Freeland felt no embarrassment in October 2017 saying, “If necessary we must put added pressure on the Maduro regime by taking concrete steps to further isolate it from the international community.” This kind of colonial language makes few in North America shudder. Nor did it worry anyone that Freeland gave political advice to the Venezuelan opposition, asking them to unite behind one candidate against Maduro. Long before Maduro announced the presidential elections, therefore, the opponents of Venezuela (the U.S., the EU, and the Lima Group) had begun the process of denying the government legitimacy. They were openly meeting as the Lima Group to coordinate strategies to isolate Venezuela and to conduct regime change there. Just before the elections, the United States and the Lima Group engineered the expulsion of Venezuela from the OAS. Meanwhile, the ALBA group congratulated Venezuela. They know that this is not just about one election or about Venezuela’s current difficulties. This is a line-struggle between the ALBA group and the Lima group, between those who want to drive a people-centered policy and those who want to drive a Wall Street-centered policy. Oil prices are high. But these will not benefit Venezuela. Its oil economy is under threat not only from the seizure of its refineries, but also by the lack of investment in its oil infrastructure. Russia and China, as if on cue, have disassociated themselves with the isolation strategy. They will return with capital both for the distressed Venezuelan economy and for the oil sector. But, of course, Maduro will have to face the crisis of his economy—whether created by the “economic war” or not. This has to be his priority—to stem the hunger and frustration inside the country. Venezuela is being garroted. Will Maduro’s government have the means to break the cord?